Here's a nice update for those who have Reference cards. In the package included, i've put 4 roms with VDDC offset. You can of course adjust these however you want, if you want to have an even tighter undervolt you can search the rom for this --> "8D 00 F8(-50)00" and replace the F8 part with EE(-112) for example. These roms also have a custom timing included. It's a basic one but it will give you a very high increase for XMR. I'm assuming this will apply to the 4GB model as its basically exactly the same...? ahh, I guess i need more psu juice to add onto my single 1050W..
Noob question how are you modding it? You dont mean just clocking the cores or? It looks like it's drawing almost 120W per card for running almost 32MH. Gonna need that new psu addon soon. 32mhs for only 120W? you kidding? that's at the GPU that's actually quite a lot. at 24Mh its about half that. Stability though will be key. doing it for 10 mins is one thing...2-3 days it altogether another story. Eagerly waiting here. Thank you so much for this Heliox. I am a day away from buying 6 more reference ones. This may be worth the wait. I'm not, GPU-Z could be though.. I'm definitely not worried about the stability. I'm very sure it will last. Temperatures didn't go over 70 degrees when pushing it (last picture). How to active mod ??? You going to work on 470's next? good to see you figured out the Windows driver signature enforcement, it's what has held back my experimentation thus far. @boysie if these are launch-day "4GB" reference cards then yes, physically identical with same 8GB memory chips, should be indistinguishable performance once flashed. Funny thing is, i tried it on ubuntu as well, i didn't get the same results tbh. (Driver on Windows for RX* cards is a lot better).. Simplest way to test is to flash an 8GB rom on a 4GB card, you'll notice quite quickly if it's one that "was" software locked. Anyhow, as i've said before, if i would modify the 4GB versions the same as i would have done with mine, results would be far better as well. Great job @Heliox! Can't wait to try it out on my 6 RX 480 rig! With luck this signature enforcement bypass can be adapted to Win7 as well. I'll do some tests later this week on Win 7..
Dunno if it's worth it to go out and buy a 470.. maybe at a later point. I had issues with 5GPU being detected..once new driver came out it all worked fine..i still had issues though but that turned out to b having 2 on the same molex string. they melted the cables buy drawing way to much power. @Heliox I think you have our attention...when do you think you will be ready to let the world have the process to achieve this? 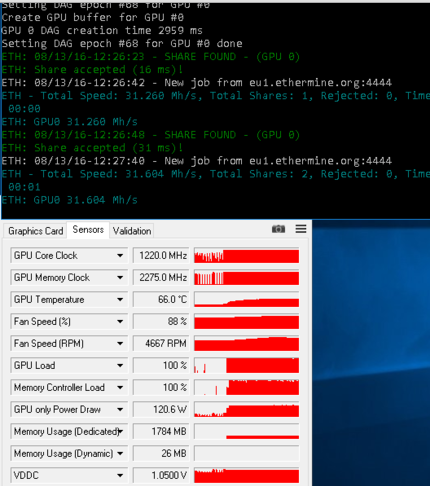 Ok, so did a dual mining run as well because a few were asking for it. Results: Core 1220, mem 2000. Eth speed: close to 28Mh, Sia: around 400+Mh. here in the us you cant find anymore ref 480s so i bought a few 470s or every brand to test. the weakest are the msi cards max mem is 1700 the 4gb oc ones , sahpires can go to 1800 but thats still low. im seeing 22 to 23 mhs range for the 470s stock with mem maxed we can proably get them to 24 mhs . you cant really compare them to 380s since they only use 100 to 120 wats and run super cool under 70 degrees.